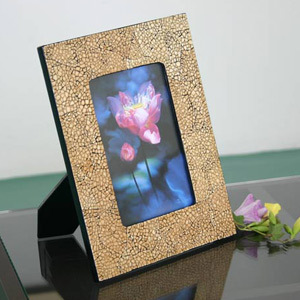 This lacquered photo frame reveals the expertise of the Thai artisans. The front is delicately decorated with an eggshell mosaic and the back and sides are lacquered in gleaming black color. 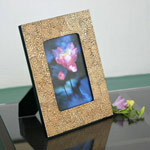 It is designed to display a standard 10 by 15-cm print. Frame: 17.0 cm W x 22.0 cm H x 1.5 cm D.